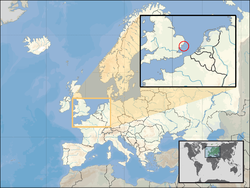 Sealand is a self-claimed country in the North Sea approximately 12 km from the coast of Suffolk. Sealand is a structure called Roughs Tower it was built in the sea by the British Royal Navy, and later became Sealand. It is very small. There is only room for 300 people on it. Even though a man named Michael Bates says Sealand is a country, not all countries agree with him. Once some people from The Netherlands went to Sealand to take it over. Michael Bates did not want this to happen, so he used helicopters and fought them to get it back. He won, and put some of those people in jail until he was pressured to let them go by other countries. If a boat goes too near Sealand, people from Sealand might fire guns at the boat. Even though Michael Bates says he is the prince of Sealand, it is very small so he usually is not there. Other people stay there to take care of Sealand. Sealand has its own stamps, national anthem, money, flag, and more things just like a real country. Bates' reasons why Sealand should be a real country are these: Sealand is out in the ocean, and when Sealand was created no country owned the ocean. Also, people asked Michael Bates to let his prisoners from The Netherlands go. Bates said that if they thought Sealand was not a country, they would not ask him to do that. The owners claim that Sealand is an independent sovereign state because in 1968 an English court decided that Roughs Tower was in international waters and outside the jurisdiction of the British courts. Map of Sealand and the United Kingdom, with territorial water claims of 3 NM and 12 NM shown. In international law, there are two common theories about what makes a state "real". These theories are called are the "constitutive" and the "declaratory" theories of state creation. The constitutive theory says that a state exists if other states recognize it, but people disagree whether this means "diplomatic recognition" or just "recognition of existence". There are no other states that have diplomatic recognition for Sealand. However, Bates says that Germany gave Sealand "recognition of existence" during some negotiations. In the declaratory theory of statehood, an entity becomes a state as soon as it meets the minimal criteria for statehood. Therefore, recognition by other states is purely "declaratory". In 1987, the UK extended its territorial waters from three to twelve miles. Sealand now sits inside waters that Britain claims as its territory. Irrespective of its legal status, Sealand is managed by the Bates family as if it were a recognised sovereign entity, and they are its hereditary royal rulers. Roy Bates styles himself "Prince Roy" and his wife "Princess Joan". Their son is known as "His Royal Highness Prince Michael" and has been referred to as the "Prince Regent" by the Bates family since 1999. In this role, he apparently serves as Sealand's acting "Head of State" and also its "Head of Government". At a micronations conference hosted by the University of Sunderland in 2004, Sealand was represented by Michael Bates' son James, who was referred to as "Prince Royal James." The facility is now occupied by one or more caretakers representing Michael Bates, who himself resides in Essex, England. Sealand's constitution was instituted in 1974. It consists of a preamble and seven articles. The preamble asserts Sealand's independence, while the articles variously deal with Sealand's status as a constitutional monarchy, the empowerment of government bureaus, the role of an appointed, advisory senate, the functions of an appointed, advisory legal tribunal, a proscription against the bearing of arms except by members of a designated "Sealand Guard", the exclusive right of the sovereign to formulate foreign policy and alter the constitution, and the hereditary patrilinear succession of the monarchy. Sealand's legal system is claimed to follow British common law, and statutes take the form of decrees enacted by the sovereign. Sealand has issued passports and has operated as a flag of convenience state, and it also holds the Guinness World Record for "the smallest area to lay claim to nation status". Sealand's motto is E Mare Libertas (English: From the Sea, Freedom). It appears on Sealandic items, such as stamps, passports, and coins, and is the title of the Sealandic anthem. The anthem was composed by Londoner Basil Simonenko; it does not have lyrics. ↑ 1.0 1.1 "Information on the Principality of Sealand" (PDF). Summit of Micronations. Retrieved 13 November 2007. ↑ 2.0 2.1 2.2 "Information on the Principality of Sealand including GDP" (PDF). Summit of Micronations. Retrieved 13 November 2007. ↑ "info_paper.id" (PDF). Retrieved 22 June 2010. ↑ "Official History of Sealand". Government of Principality of Sealand. Retrieved 12 January 2007. ↑ Ryan, John; George Dunford, Simon Sellars (2006). Micronations, The Lonely Planet Guide to Home-Made Nations. Lonely Planet. pp. 5–6. ISBN 978-1-74104-730-1. ↑ "Offshore and offline?". BBC News. 5 June 2000. Retrieved 9 April 2009. ↑ 11.0 11.1 "Information on Sealand's royal family". Sealand News. Retrieved 13 November 2007. ↑ John Ryan, George Dunford & Simon Sellars (2006). Micronations. Lonely Planet. p. 8. ISBN 978-1-74104-730-1. ↑ "Information on Sealand's royal family". Government of Principality of Sealand. Retrieved 11 November 2007. ↑ "Information on the Principality of Sealand including constitution" (PDF). Amorph Summit of Micronations. Retrieved 9 November 2007. ↑ "The Principality of Sealand statutory notices". Government of the Principality of Sealand. Retrieved 27 July 2006. ↑ Guinness World Records 2008. Guinness World Records. 2007. p. 131. ISBN 978-1-904994-18-3. ↑ Note that this is not "normal" Latin; "mari" would be more correct. ↑ "Sealandic National Anthem". Nationalanthems.info. Retrieved 15 November 2007. This page was last changed on 27 March 2019, at 02:33.